Since 1978, 186 different grizzly bears have been captured and radio collared in the southern half of the Flathead valley. Technology has changed over the years. 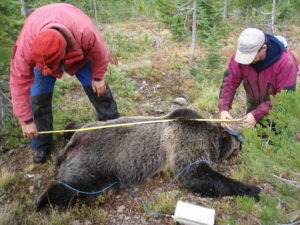 Bears with very high frequency (VHF) collars had to be tracked on the ground or from an aircraft but since about 2000, GPS collars have been used. These collars use a GPS to calculate the animals locations and then send the locations to us via a satellite connection. Radio locations provides information on habitat use, daily movements, home ranges, den site locations, and survival of the collared individual. Further investigation of locations provide us with information on reproduction and causes of mortality. We have estimated what bears eat by watching bears feed, examining sites after they leave, analysing their droppings or scats for remains of what they ate, and by measuring stable isotope ratios of Carbon and Nitrogen. We also collected samples of their foods every two weeks and analysed them for digestible energy and protein. 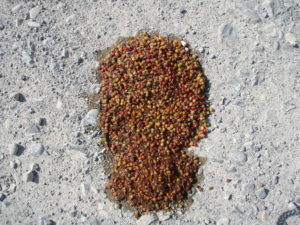 In combination, these methods provide a picture of what the bears eat across their active year and, how important different foods are to the growth of both individual bears and the population. In addition to live captured bears, both bait sites and rub trees are used to collect hair samples from bears within the study area. Standard methods are used to produce genetic fingerprints and assign each bear a unique identity. Gender is also assigned using generic analysis. This non invasive method of sampling not only allows us to identify individuals and gender but estimate populations size, population growth and in some cases dispersal. Genetic sampling allows the tracking of many more individuals than is possible using radio-collaring. We have sampled the Flathead since 2008 while the South Rockies to the north has been sampled since 2006. Most of these area was also sampled in 1997 and partially sampled in several other years giving us the ability to ask questions that span decades. Bait sites and rub trees are spaced evenly across the study area where possible, although access affects trap spacing in some areas. Genetic samples have also be used to compare genetic diversity among neighboring populations (Proctor et al., 2013), assign parentage and calculate individual fitness , and identify individuals that have moved out of their birth population (Proctor et al., 2013) which are both future objectives of our work. In addition to collecting hair samples, we also monitor grizzly bear mortalities in both populations. In the 8 years between 2004 and 2014, 116 grizzly bears were killed in the South Rockies, while 44 were killed in the Flathead. It is important to identify the causes of mortalities and monitor how these mortalities affect the population so that mortality factors can be mitigated and new threats can be identified. This information can then be used to mitigate mortality by management actions on the ground. Reproduction was the lowest ever recorded for grizzly bears in North America in the south Flathead between 1998 and 2010 (McLellan, 2015). The South Rockies GBPU is also thought to have experienced low recruitment in concert with very high mortality during the same time period (Lamb et al. 2016). This low recruitment was associated with very low huckleberry production compared to earlier decades (McLellan, 2015). Using both demographic data, the trend in food sources, and the monitoring of mortality sources, the South Rockies Grizzly Project aims to monitor and manage the grizzly population in the southern Rockies of British Columbia so that population remains stable and viable for the future. Identifying factors that drive trends in population size and structure allow scientists to make suggestions for land and animal management that allow appropriate action to safeguard this population of bears.